Ocean Hills Kiama is a stylish, contemporary, 4 bedroom, 3 bathroom executive holiday residence overlooking beautiful Loves Bay on the southern fringe of Kiama, less than 2 hours from Sydney and the perfect house for an escape to the seaside. This property allows easy pedestrian access to the Kiama Coast Walking Track, Loves Bay and East’s Beach. 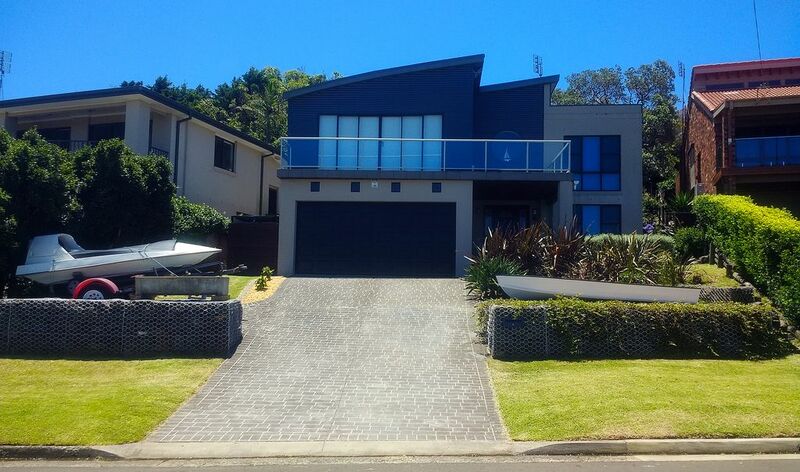 Kiama township, quaint harbour, ocean swimming pools and beaches are a short drive away. The Kiama CBD has a cosmopolitan restaurant, café & shopping precinct, the Blowhole, heritage buildings and large family-friendly parks with playground facilities & seating. - 3 bathrooms, main with full-sized bath, master bedroom with ensuite. - Lounge room offers large-screen TV with a collection of DVDs. - The modern kitchen has stainless steel appointments with gas cooktop, microwave, dishwasher, and double-door fridge/freezer. - Downstairs will delight any reader with a separate well-stocked library/TV room. Pick a book, (it will be hard to choose) and relax in comfort. The library/TV room also offers an Xbox with a variety of games for kids entertainment. - Laundry with washing machine & dryer and access to outdoor clothes line. - Bedrooms & library are carpeted, foyer & bathrooms are tiled, main living area has polished floors. - The property is landscaped with a terraced rear garden offering barbecue, dining setting and views. Enjoy watching the birdlife as they snack on local flora. - Off-street parking for 2 cars, no garage available. - Quiet, peaceful location with stunning views over Loves Bay and grassy farmland. Baby cot is provided, free of charge. Please contact us for further information, pricing & availability. There is NO booking fee for this property. Minimum 2 night bookings off-peak; minimum 3 nights on long weekends. Minimum 3 nights on mid-week stays. School holidays, Easter and Peak Season may be a minimum of 5 nights, please enquire. Smoking indoors & pets are strictly not permitted. Noise and disturbance to neighbours at any time is not acceptable and may lead to early termination of rental with no compensation of monies paid (see Terms & Conditions emailed prior to payment). We value your booking and enjoyment - this property is in a quiet residential area. Payment of deposit signifies acceptance of this property's Terms & Conditions. Bond $1000 refundable on satisfactory inspection after check-out. This property has 6 beds and sleeps a maximum of 8 people. - Guests are responsible for damage, breakages, theft and loss of the Property and any part of it during their stay. You must notify us of this immediately. Management may recover from You the repair or replacement cost (at Management's discretion). - Only the Guests nominated and agreed in the Booking may stay in the Property overnight. If any other Guests stay, extra charges may apply or the agreement may be terminated immediately without refund and you will be required to vacate the property immediately. - With respect to OH&S and Fire Safety issues you MUST declare the number of adults & children staying overnight, each night, at this property. A maximum of 8 people is the legal limit. - Any disturbance to our neighbours, including excessive noise, is prohibited and may result in immediate termination and eviction without refund. Extra charges may be made for security and other expenses. - Parties, functions, large groups and pets are strictly prohibited. Smoking permitted outdoors only, butts must be disposed of responsibly into garbage and not into garden areas. - Guests are responsible for Visitors to the house and to ensure no disturbance of neighbours or undue noise occurs at any time. Silence and consideration are expected when entering and leaving the premises, no behaviour likely to cause damage to property or offence or embarrassment to others, all noise to cease by 10.00pm. This is a Council regulation. - Air conditioner unit must be turned off by 10.00pm to minimize noise & disturbance overnight to close neighbours. This is a Council regulation. - Property has outdoor security cameras to help with your protection and safety. What can I say. A PERFECT guest. Great position and perfect for us! We were 4 couples meeting for a long overdue catch up. House was perfect with 4 bedrooms ( each with double or queen) and 3 bathrooms, well equipped kitchen and fantastic views from the open plan living area. The library downstairs was a quiet retreat for anyone who needed space. I could see the house working well for families as well. The greeting on arrival from Guy was great with the little extras he provided being very much appreciated after our journey. Highly recommend Coastal Blue, just fabulous. We thoroughly enjoyed our stay at Ocean Hills Kiama. We arrived Saturday afternoon, and were greeted by the owner Guy, who showed us around the house. All the amenities you would need for a weekend away, were at our fingertips. The views were amazing and the house took full advantage of this. Will definitely come back again! My family had 5 nights in this lovely house. The landlord was helpful and friendly. The backyard gardens were a wonderful backdrop to our family BBQ photos. The early morning sun for breakfast on the front verandah and afternoon shade while enjoying a drink, a board game or just the view was very much enjoyed. I would definitely recommend this property. 5 friends and I stayed here for 2 nights a couple of weeks ago and we absolutely loved the house. The view is amazing even when the weather outside is awful! There is everything in the house you need. Highly recommend staying here!